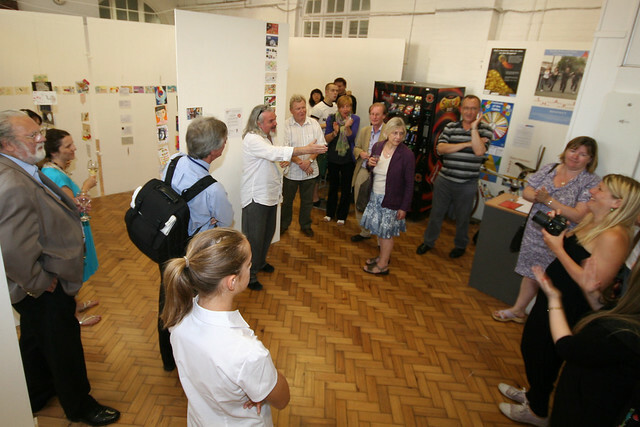 On Wednesday 29th June, 2011 The Penny School Gallery in Kingston had a special preview of our postcard show, My Extraordinary Imagination as part of the Kingston International Youth Arts Festival. This show was the first to be put on with the educational wing of my REAL wall, which is called Schoolswaps. The turnout was good, with invited guests from the local area including Robin Hutchinson, the director of Creative Arts, who are the lovely people responsible for putting on the Kingston International Youth Arts festival. He’s the one below gesturing, and he’s gesturing at Zoe Thomas, the person responsible for coming up with the idea of the show and getting the team together to make it happen with me, Andy Hoang of Schoolswaps. 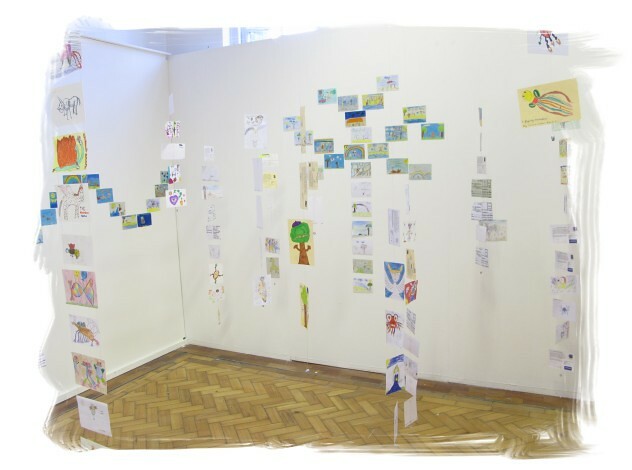 The postcards were mounted on boards and hanging strings, roughly in age order around the gallery starting from the 4 year olds in one corner and going up in age to include some work from 17 year olds and included work from as far away as Australia, Germany and Korea among others. 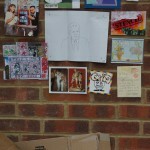 There are still artworks coming in to the IYAF offices every day, and the postbox remains open to entry for another week. We will try and get as many of the later entries on the wall as we can, but can’t promise anything. However, I’ve heard a rumour that there is interest from abroad to show the cards on a wall in another show, so watch this space! For those of you not able to come to Kingston who have contributed from far off countries, I’ve taken quite a few pictures for you to see. OK, I got a little excited, and actually took a LOT of pictures for you to see, but with more than 600 cards on display, make sure that if you can get to the gallery you do, as this is by no means all of them! Some of the received postards for the IYAF show, My Extraordinary Imagination, taking a tour around the historic town of Kingston upon Thames before going on display at the Penny School Gallery for the show, which runs from 1-18 July 2011. 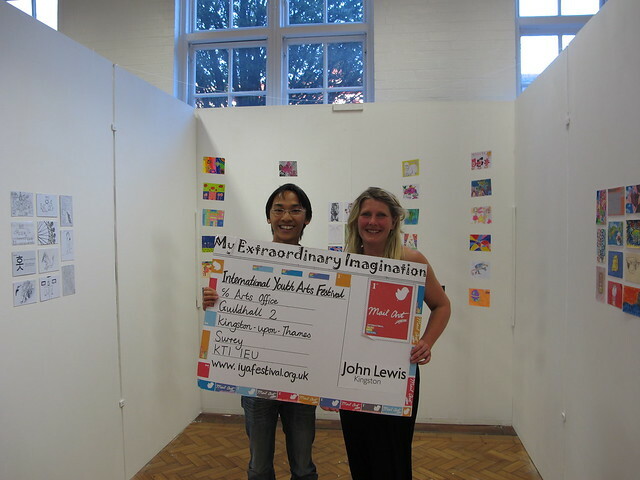 The show was coordinated by IYAF in collaboration with my REAL wall‘s educational postcard offshoot Schoolswaps and has collected in over 600 postcards drawn by students all over the world. Before going into the gallery, we thought it would be nice to show the postcards a little bit of the local area. 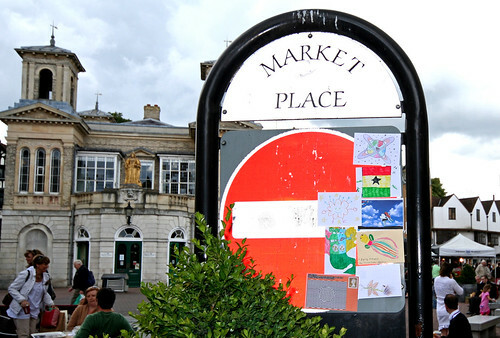 Here they are briefly on display in Kingston Market Square, where there’s usually a fruit and veg market and some great food and entertainment. We can see post here on the sign from Germany and the UK among others. If you took part in the show and sent us something can you see yours? If not, keep watching the site and maybe your piece will be up soon! 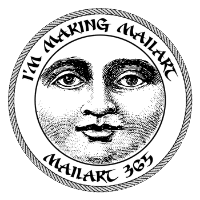 If you are aged under 26, and wondering how to get your mailart into the show it’s not too late to enter your piece! If you send it quickly to us we may be able to fit you in! Full details of how to get involved are at our website but do hurry as time is running out! Kingston upon Thames is the main town in the Royal Borough of Kingston upon Thames in London. We also thought it would be nice for everyone who sent in to see a little of Kingston too, so what better way to show you both a preview of the postcards and a little of Kingston all in one go! 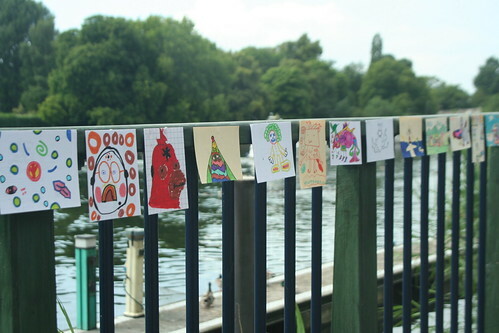 Here are your postcards next to the River Thames, just minutes away from the gallery. Make sure you make your way down to the gallery to see all of the postcards in all their full glory, and if you haven’t sent one in yet, why not! It’s not too late, just get over to iyaf.schoolswaps.net for more information on how to get involved. As part of my continuing quest to get people writing and connecting in the post, I’ve started my REAL wall‘s educational wing, www.schoolswaps.net, designed to make it easy for teachers to arrange postal swaps for their classes. 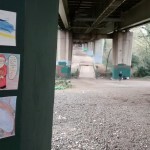 The first major project of schoolswaps is a collaboration with the Kingston International Youth Arts Festival (IYAF), who called me when they saw the work I’d done with art students at my university and asked if I could help them work out how to get young people making art and sending it to their show. Now, after a few months of tireless work, the team at IYAF have deservedly received 429 postcards, with a while left to get more. 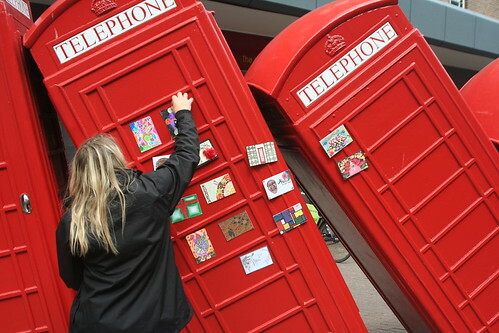 “Out of Order” by David Mach, is in the centre of the town and shows a load of the old iconic red telephone boxes tumbling into one another.